Famous names and distinguished provenances grow on portraits as casually as barnacles on a boat's bottom, and they are rightly regarded with suspicion. A complete account of Raphael's catalogue of paintings will also examine lesser known pieces that have been linked to him or his studio. Often these works are in private collections, hidden from view and generally known only to specialists. Occasionally such works enter public view, as part of an exhibition or sale. The following case encompasses each of these states. Portrait of a Young Woman was once in a private collection in Genoa, until its alleged acquisition by an Italian art dealer in 1947. In 1969, it was purchased as a Raphael by the Museum of Fine Arts in Boston, destined to become the jewel of its collection, and coinciding with the museum's centennial celebrations. The events around the painting's acquisition and the international scandal it caused have not been reported at any length in a publicly accessible online forum. The following post aims to outline the particulars of the painting's attribution and its controversial recent history. I would like to clarify I have no particular inclination towards the attribution. Instead, this case presents a fascinating opportunity to further explore the dynamics of the attribution process. With the lack of historical and technical data supporting the piece, commentators have seemed increasingly at a loss to account for its place in Raphael's body of work. The greatest effort was expended by renowned Raphael scholar John Shearman - yet even his account raises more questions than answers. In the most recently published Raphael catalogues, the piece is either missing or given an unconfirmed or rejected attribution. In each case, these assessments are based on little more than speculation, often made without having viewed the work directly nor providing a detailed account of its physical features. It is hoped this outline will furnish the available details as well as be updated with new information as it is made available. It is important to delineate between the factual provenance of the piece acquired by the Boston Museum of Fine Arts (MFA) and the speculated provenance details supplied by commentators. The factual provenance refers to verifiable records of the physical item. Ideally it should mention dimensions, other identifying marks on the front or back of the panel. In this case, it is difficult to trace factual provenance beyond the art dealer who sold it on to Boston MFA in 1969. The other provenance details provided in the accounts by Shearman and Getty do not contain any references to images or documents physically verifying the panel existing in a collection at a particular time. The portrait reappears not only with a traditional attribution, but also with a specific identification and provenance. It is said to represent Maria della Rovere, and to have belonged to Pope Julius II; from the Della Rovere it is said to have passed to the Fieschi family. Shearman goes on to reject the identification of Maria della Rovere, and proposes Eleonora Gonzaga as a more likely candidate. Shearman's premise is based on documentation describing the intended marriage of Eleonora Gonzaga (born c.1492) to Francesca Maria della Rovere. Such a marriage would have strengthened ties between these two prominent families - the Gonzaga in Mantua and the della Rovere in Urbino - the latter also being directly tied to the Papacy through Pope Julius II (Giuliano della Rovere). Correspondence cited by Shearman indicates a drawing had initially been sent, but Julius II (and Giovanna) expressed a preference to see a painting. It is hence argued that Raphael was commissioned to create this portrait, the counterpart of which is the Portrait of a Boy with an Apple, tentatively identified (but not universally accepted) as Francesca Maria della Rovere. 1505 April 29. A Letter from Isabella d'Este. 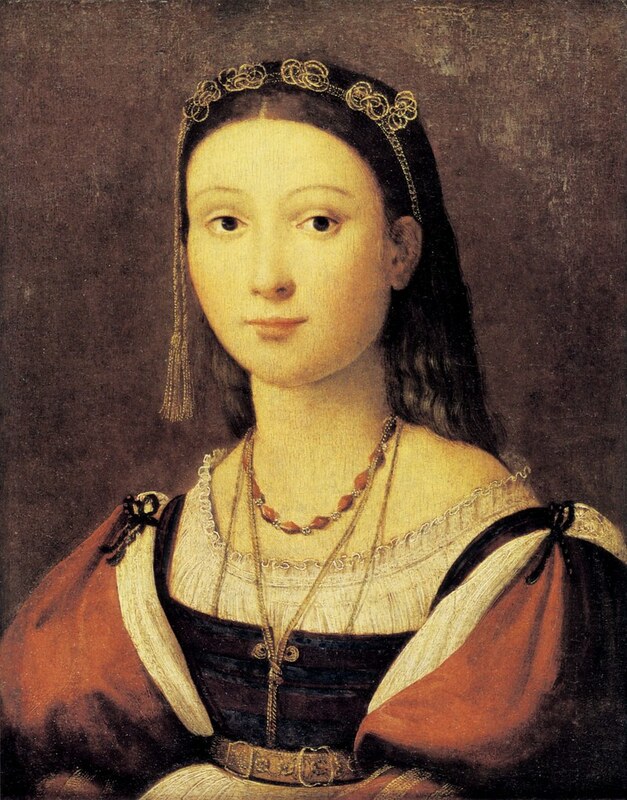 Its recipient is not confirmed, but argued by Shearman to be Giovanna Feltria della Rovere, Duchess of Urbino. I would have sent the portrait of Elionora to Your Excellency, as you requested, if there had been a painter here who knew how to paint well; I am waiting for one to arrive and then I will have it made at once and sent to you. With regards to the nominated date, Shearman's assessment is made via consideration of Raphael's stylistic development, and the extrapolated age of his purported sitter. 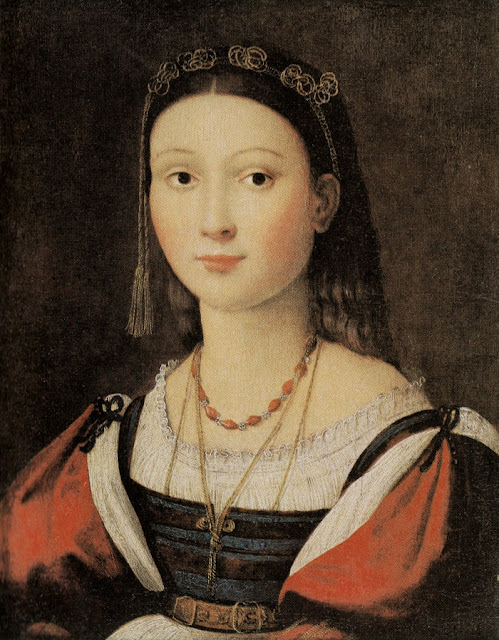 The spring of 1505 would be a reasonable date for the Boston portrait...Eleonora was about twelve at that time and a similar age is imaginable for the girl in the portrait (the childish proportion of head to bust is even more suggestive of such an age than the childish features). Furthermore the supposition that it was painted from a drawing and not from the life will provide an explanation of the contrast in treatment of the head, where he seems constricted, and of the bust, where he seems freer to be himself. From this point, the history of the painting in unclear, until it resurfaces in the 20th century. 1947 Reportedly acquired from the Fieschi by art dealer Ferdinando Ildebrando Bossi "..for a very small sum of money" (Getty) This point is in dispute - Getty cites members of the Fieschi family stating it was never sold to Mr. Bossi. The outcome of the judicial inquiry launched into this aspect of the case was not described in sources examined. 1969 Perry Rathbone (Director, Boston MFA) and Hanns Swarzenski (A curator at Boston MFA) travel to Genoa to acquire the painting from Bossi. Getty surmises the painting was first taken to Switzerland, and it is from this point that Swarzenski escorted the work to Boston. This step seems to have been taken to circumvent the fact that permission had not been sought/granted from the Italian government for the export of the painting, as required by law. In addition, the panel was also not declared at US customs when it entered the country in 1969, hence also breaching legal requirements on this end. 1971 September 10. Panel handed over to an Italian consular delegate in Boston and subsequently escorted to Rome. At this point, the seized panel officially became property of the Italian government. 1982-3/2001 Reported in Maltese (ed. ; 1982) to be in storage in Florence at the Soprintendenza Beni Artistici e Storici. Penny and Jones (1983) add it is undergoing restoration. Meyer zur Capellen later confirms it is still in Florence in 2001. From sources examined, the particulars of its journey from Rome to Florence (or any intermediate location) is not currently known. Details regarding its present location will be added as they become avalable. Subsequently, the factual provenance of this piece pertains to the acquisition of the panel in 1969. This information may indeed exist, but the controversial fate of the work has since obscured this aspect of the painting's history. Perhaps the most notable aspect of this picture is its controversial recent history. On January 23 1970, it was unveiled by Perry Rathbone, then director of the Boston MFA as a new Raphael acquisition, coinciding with centennial celebrations at the museum. By late 1971 it was back in Italy. Getty's account describes two separate breaches according to the statutes violated in each country. In Italy, an investigation was launched by Rodolfo Siviero, the Italian Foreign Ministry delegate for the Retrieval of Works of Art. Despite being in private ownership at the time, export of a work identified as an important part of the nation's cultural heritage required government authorisation. Failure to acquire this permission was regarded as illegal, hence falling under Article 648 of the the Italian Penal Code, which refers to the receiving of stolen goods - an offence which carried a six year prison sentence at the time. On the US end, Getty clarifies that the Tariff Act of 1913 allowed duty free importation of artworks into the country, provided they are declared. As no such declaration was made, it became legally regarded as an act of smuggling under Section 545 of Title 18 of the United States Code Annotated. A breach of this attracted a $10,000 fine and/or a five year jail sentence, with goods recovered hence forfeited to the US government. In June 1971 an agreement was reached between the Boston MFA's Board of Trustees and Ridolfo Siviero acting on behalf of the Italian government. It stipulated that the painting was to be returned to Italy and that this action guaranteed "no further claim against the Museum of Fine Arts in Boston or its Board of Trustees or any of its personnel". With the return of the painting to Italy in 1971, its ownership was ceded to the state. Meyer zur Capellen notes "although the picture seems of good quality, it shares no stylistic similarities with authentic portraits by Raphael". De Vecchi, having sighted only photographs further adds, "the painting has some weaknesses which cast doubt on the attribution to Raphael". The sitter is depicted in 3/4 pose. 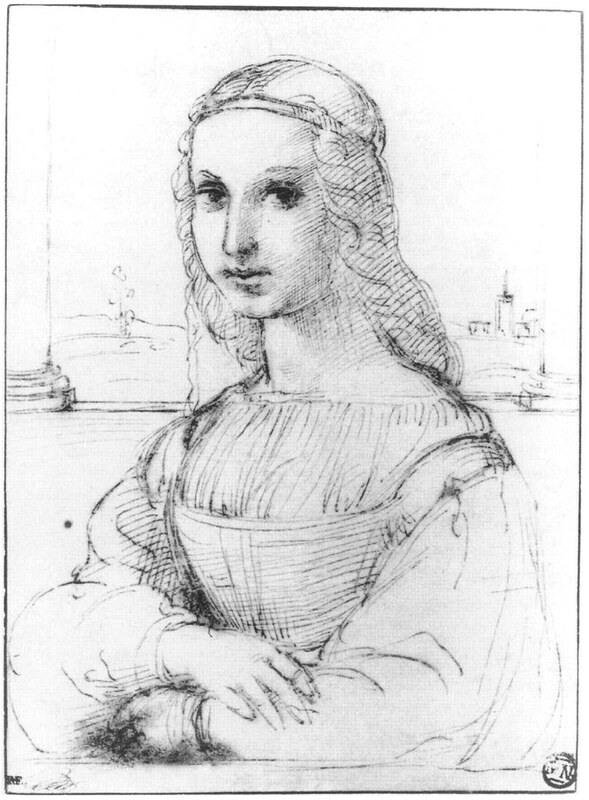 Among Raphael's known works, it bears the closest compositional relationship to La Muta and the Louvre sketch allegedly made after the Mona Lisa. Hence, the date of the piece is estimated at an early point after Raphael's documented arrival in Florence in 1504. Shearman speculates it has been painted for the Court of Urbino and tentatively identifies the sitter as Eleonora Gonzaga of Mantua. On this point Meyer zur Capellen clarifies, "Shearman's argument is based primarily on historical circumstances and provides no evidence either for the attribution or identification". Shearman's 1970 account is presently the most accessible. Jones and Penny also mention the panel undergoing restoration "in Italy" in their 1983 publication. In 2001 Meyer zur Capellen offers no further detail on condition beyond it "seems of good quality". It is unknown whether he had sighted the original in this instance. Shearman's assessment was based on a visual assessment supplemented by X-ray and infrared images. The condition of the portrait on the front is in many respects remarkably good; it has certainly never been over-cleaned, and abrasions are very small. The only disfigurement arises from a vertical craquelure, which is not absolutely of serious scale but is relatively disturbing over the flesh-painting in a work of such delicacy; consequential retouching here and there on the face, cosmetic in intention, distorts the reading of form in two important areas: over the bridge of the nose and along the jaw-line up to the left ear. If the hair is overpainted. however, it was done by a restorer earlier than the one who retouched the face, since it is still covered by a layer of dirt that does not extend over the flesh. Updated details on restoration and condition will be added as they become available. In reviewing the evidence, the contrast between Shearman's assessment and that of the short entry in Meyer zur Capellen's catalogue is notable. Shearman himself acknowledges the paucity of direct evidence linking the panel in question to not only Raphael but his identified sitter - which itself differs from the previous identification of Maria della Rovere. Meyer zur Capellen's assessment is at once pragmatic and accurate, yet also worthy of questioning as to why this methodology is also not applied to other works that are elevated to autograph status in his catalogue, such as the Portrait of a Lady with a Unicorn (first attributed to Raphael in 1927) or the Portrait of a Boy with an Apple (first linked to Raphael in 1905). In each instance, a significant degree of documentary evidence is indeed lacking, where stylistic considerations instead are cited as key factors supporting the attribution. Notably, the Portrait of a Young Woman seems to suffer for having a far shorter critical history than its counterparts. In terms of consensus, the longer a work has been considered to be a Raphael bears some weight in ongoing assessments of its merits as an autograph piece. With the controversy that consumed this panel in the 1970s, it seems this charming portrait has not had its chance to be adequately discussed. Updates to its current location and condition will be provided as they become available. Recent or high quality images of this piece have proven hard to come by. Colour versions were published by Shearman (1970) and Jones & Penny (1983), of which the above image is a scanned and digitally tuned facsimile. From a purely stylistic point of view this really doesn't look like raphael, especially if its dated to the early 1500's. http://allart.biz/up/photos/album/R/Raphael%20Sanzio/raphael_77_st_sebastian.jpg His saint sebastian was painted a few years earlier than the date attributed to this piece and is far more technically precise! Also, look how much worse the red pigment has aged in comparison to the sebastian, yet the rest of the picture is in good condition and seems not to have been mistreated. From a painterly point of view this painting really does look like it was completed by more than one set of hands - its hard to believe one could be so delicate in the painting of that tassel and yet so clumsy and heavy handed in the painting of those sleeves - especially given that raphael finished all his surfaces evenly. I understand that the red (and the ultramarine of her waist) has perished over time, but looking at the transition from black to red in the upper half of the right sleeve, its hard to believe something so amateurish would have left raphael's hand at this point - especially when you look at every other sleeve raphael painted at the time. I know raphael used dark colours to outline and emphasize his forms sometimes (st catherine springs to mind) but to use black so crudely and to create those folds at the top of that sleeve so rigidly seems to denote an awkwardness in draftsmanship that raphael was thankfully free from. Hello Joshua - thank you for your comments. I am curious as to what you are basing this analysis on - do you have access to a high quality image of this piece post restoration? I hope you are not basing it on the above image, which is a low fidelity scan of Shearman's 1970 article (I know because I scanned and tweaked it myself). These subjective terms, "amateurish" and such have no place in a detailed analytical methodology. You can more easily show a less accomplished technique by detailed (ideally multispectral) images which show application of brushtrokes, and layer analysis measuring thickness of selected areas looking for consistent points of comparison. These again can only be measured against known works, and similar works by other artists of the era. For Raphael, this type of detailed gorundwork has only started - as reported in the fascinating publication by EuArtech, but alas this portrait is not represented in its findings. We presently do not have a report of the degree of restoration, beyond Shearman's assessment, let alone pigment, ground type etc. Also, is Saint Sebastian really a good baseline here? It has also been covered and 3PP, and its attribution is not based on solid documentary evidence but a stylistic assessment. Quite simply, it has a long critical history of being viewed as a Raphael - an assessment based not on any concrete evidence. Why can it not be Perugino, for example. Also, you compare two works of disparate size, which would be a key factor in comparing their execution. Much more detail is required here I'm afraid - the restoration report is of course a good place to start - if I can get my hands on it - I'll update this entry accordingly. As usual, a very thorough job. Has anyone paid attention to the fashion (hair and clothing) of the sitter? It might help in determining the date and location. I was weary to cite any of this as it was not verified by external references on fashions of the era - also the Costa attribution and d'Este identification also would need to be checked/updated. It was hence introducing too many assumptions without verification - and was omitted. If anything, it may allow us to contemplate Lorenzo Costa as a possible alternative author of the ?Eleonora portrait, given he was known to operate within the Mantuan court. But again, my references on Costa are far too scarce for that to be anything more than speculation. Shearman was usually thorough enough to go through such permutations, yet something about this Burlington piece seems rushed, truncated - completed as it was to time nicely with the unveiling of the piece at the Boston MFA. ie. the painting was unveiled Jan 1970, the Burlington published Shearman's piece in February. If anything, one admires the co-ordinated timing of it all - given that it was an age long before internet communication! H Niyazi again gives us most impressive report for this uncertain Raffaello. His work creates great interest among associates. Hey Hasan, thanks for the reply. Although the scan in your article is low-fi, I was only commenting that the level of finish in certain details of the image (the tassel, for example) are of a much higher finish than that of the sleeves and that I found this peculiar considering the attention Raphael paid to finishing the surfaces of his figures . Unless the image quality is uneven and clearer in some areas than others I believe this makes sense. Also, about the way the red pigment has aged and the comparison to the sebastian, I'll use another example and go with the madonna of the medow. http://3.bp.blogspot.com/-bOGfdGH-5CY/TZxx6hfjHLI/AAAAAAAACEk/9Udcbfg7LKE/s1600/raphael_madonna_goldfinch.jpg This painting was painted chronologically quite close to the portrait in the article, and even in its very damaged state the reds haven't receeded nearly as much as those of the portrait. Again, although the image in the article isn't ideal I think this damage is visible due to the distinct lack of highlights - a common symptom of deterioration in pigments (think ultramarine sickness). One could argue these highlights may not have been painted at all but it would be rather strange to paint such heavy dark passages so crudely if one was not going to illuminate them with a strong light source! (think the transfiguration) Unless the image quality is uneven (as the face has reproduced rather well and does not suffer in the way the sleeves do) I think this holds up. @Mauro - Welcome to 3PP! Thank you for the kind comments. I hope there are more rational commentators on Raphael attributions than you are indicating, or we are all in trouble! @Joshua - thank you for the clarification. I can definitely understand the temptation to express one's inclination without being entirely sure. I think my clinical training has trained this tendency out of me! Raphael scholarship is among the most voluminous in Renaissance art history - yet the deeper one looks at attributions, it seems to be built on a tradition of opinion rather than a discrete methodology. Even Meyer zur Capellen, having chosen to revise the critical catalogue format to include technical evidence, can't seem to tear himself away from plainly guessing at dates and attributions when there is an overhwhelming lack of anything tangible. The quote Bernard Berenson, the "proofs are in my head" approach is not going to cut it anymore. I'm hoping I can at least highlight the need for a more sound methodology in my ongoing accounts of Raphael pieces, which will eventually be presented in one combined resource. This is my first post but I have been following your analysis for roughly 3 months now and find it very thorough and thought provoking. I would like to offer another potential candidate for the artist and sitter. My only reasoning is the rough timing and resemblance to Parmigianino's painting "Portrait of a Young Woman". I realize that the face in the potential Raphael painting is more rounded than the Parmigianino portrait and younger looking, but this could be accounted for by either the young girl growing up and losing "baby fat" as she matures or possibly the inexperience of a younger painter painting very early in his career. To me the almond shaped eyes, long nose and lips are very similar. My thought would be he could have painted this young girl at a young age and then maybe 8 to 10 yrs later painted her again. The girl could be roughly 12 yrs old in the first painting and then say 20-yrs old in the Parmigianino painting. One of the issues I do see is some of the potential timing of locations and dates when this painting is said to be made does not coincide with Parmigianino's life. The date of the painting is 1505 and Parmigianino was born in 1503 and even though he appears to be a child prodigy (his first recorded work in 1519 on Wiki shows him being roughly 16 yrs old. ), I'm sure he wasn't that good at 2 yrs old. My other thought is it appears a lot of master painter's early works are not known or lost overtime or are attributed to others. It must be extremely difficult to be able to figure out who painted most painter's very early work because they have not developed their style yet, unless you have the provenance and I would assume in most cases there would rarely be any for a painter early in their career. My assuption is purely hypothetical. I look forward to your opinion. Greetings Jeff H - welcome to 3PP. Physiognomic similarities can in some cases be a valid single point of comparison among many. This was seen in "La Bella Principessa" noting the similarities between that drawing and one in Windsor. They can also be problematic, as in the case of the curious "Judgement of Paris" reported earlier at 3PP, in which the reporting art historian convinced themselves they could see Raphael and his lover in the piece. These factors do not make an attribution - many quality points of comparison will. I would invite you to read my framework for reviewing attribution reports (including your own formulations). If you can fill out detailed answers to each point - Subject, Documentary, Condition and Consensus (SDCC for short), then you are on your way! Anything less than this really is a flight of fancy, no matter who is behind it, from humble blogger to lofty scholar. That article by Clive F. Getty is really fascinating to me (but you know how much I love art crime and scandal). I'm so glad you provided the link. I'm especially intrigued at how works of art could be brought into the country as "duty-free," but they needed to be declared! It seems like the Italian government should do something about this painting that is in its possession. I'm glad that your blog can bring more attention to this piece, at least. I look forward to reading more updates on your blog, as they become available. Hello Bill - you mention a print - is it from an engraving or etching etc- do you know its author - title? It would be curious to know if it was labelled as "Eleonora" because by Shearman's account this identfication was made by him in 1970 - prior to this the portrait was believed to represent Giovanna Feltria della Rovere - an ID which Shearman gives us no background to, but only mentions in passing.. "it comes to us with"
Do you have any information/images that you can share on these prints, or at least the copy you own - its provenance etc? Please feel free to write to me with the email adress you can find in the "about" tab above. The print I have is the Eleonora Gonzaga print that you show. and entering the number 00194029 in the NCTN field. A zoomable image is provided, showing much more detail of the surface. Thank you for providing this detail Jan. So it seems the portrait is still in Florence - I wonder if it was restored as indicated in Penny/Jones? It is a shame that the picture lies out of sight. Hi Hasan it has been a while from our connection. I am now on the idea of putting a book together and some of your knowledge will be very helpfull. Would you mind if I entered some of your work into my blog? Hello Bill. You are free to link to this post's web address or quote sections, as specified in the tems of use on the about page. The existence of that image you are investigating is indeed a curiousity, particularly since the provenance of the painted version apparently has it buried in the Fieschi collection in Genoa for such a long time. Good luck! Does anyone know if there was a painting on the back of said panel. I haven't heard any mention of it? I haven't heard any mention of there being a painting on the back side of the panel? Does anyone know if there was? I have what I think is a print in near mint condition.